Blonde hair is dazzling and lovely to look at, but keeping that luminous effect is harder than one might think! Blonde locks have a tendency to look faded and dull a few weeks after treatment, and the harsh chemicals can cause breakage and damage. Take care of your vivid blonde manes by using one of these 7 BEST shampoos for blonde hair! Every blonde-headed gal knows this story all too well: you leave the salon with deliciously bright blonde locks, only to be left with washed out manes a week or two color. 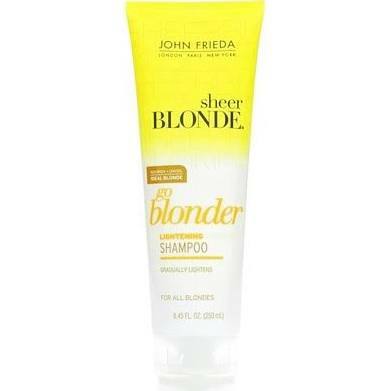 It’s no secret that bleach blonde hair color fades with time, which leaves you saying “Geez, I wish my hair was brighter!”; and that’s why the John Frieda Sheer Blonde Go Blonder Lightening Shampoo is an excellent choice for blonde. Whether you’re hair is highlighted, color treated, or naturally blonde, this fab shampoo has the power to brighten your mane for a bright, all-natural finish that shimmers in the sunlight. Plus it’s LESS than $5- what a STEAL! Every blonde-haired girls’ worst dream is to wake up with an ugly, unsightly brassy yellow shade in her recently colored-treated locks; and unfortunately, it’s a terrible wake up call that happens all too often. 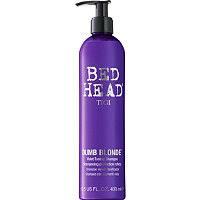 But have no fear- Bed Head Dumb Blonde Purple Shampoo to the rescue! 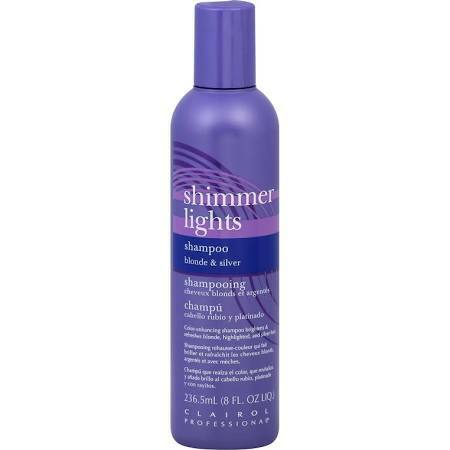 This wonderful shampoo for blonde hair not only restores and revitalizes cool tones for beautifully blonde locks, but also uses purple toning pigments to combat any brassy tones so commonly found in color-treated hair. Gorgeous shiny blonde locks free of frizz, static, flyaways, and dullness- all for just $15! Bleached blonde hair is a magnificent sight, is it not? However, as downright gorgeous and eye-catching as it is, it definitely does a number on hair. Many bleachers end up with dried out, brittle locks that are anything but cute; and if that’s the case, you need a blonde shampoo with a protein enriched formula- just like the one found in Clairol Professional Shimmer Lights Shampoo! Perfect for white, highlighted, and light blonde manes, this shampoo keeps hair looking fresh and light while also deeply conditioning dried out locks. Soft, flawless locks for just $9! Girls LOVE this shampoo, and there’s really no questioning why- it’s one of MANY amazing Paul Mitchell products that get the job DONE! The Paul Mitchell Forever Blonde Shampoo is guaranteed to keep your blonde mane looking dazzling and refreshed, while an ‘exclusive’ KerActive protein hugs the hair and repairs all of the damage caused by bleach. With an intense dose of moisture and shiny, refreshed locks that shimmer and dazzle, it’s no wonder this product gets 5 stars! Only $18! Why stick with just basic blonde hair when u can make your blonde hair an IDOL!? Women love the Redken Blonde Idol Shampoo because it gently cleanses and softens locks without stripping any color, which means your hair will be left feeling silky smooth and brighter than ever. 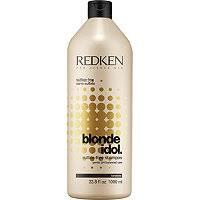 With a Kera-Bright system and pH balanced formula, this is a fabulous blonde hair shampoo for just $15.99. Blonde locks have a tendency to look washed out and lifeless a few weeks after bleaching, so how do we combat this awful experience? The key word here is: prolong. 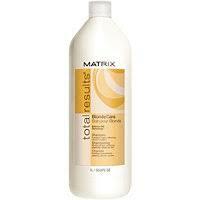 You need to prolong your bright, luscious blonde manes, and that’s why the Total Results Blonde Care Shampoo by Matrix is such a GREAT choice! This uniquely formulated shampoo prolongs shiny blonde manes while softening and detangling. That’s right, detangling. So if you’re one of those girls who struggle with tangled locks, definitely consider this shampoo for just $16! 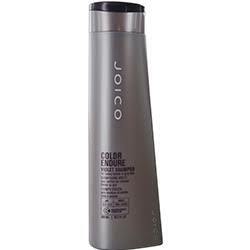 Infused with a high level of violet dye, Joico Color Endure Violet Sulfate-Free Shampoo has the power to cancel out yellowness and any brassy undertones, leaving your locks looking radiant! Glistening blonde locks are left feeling strong, soft, and protected from breakage or any other damage for just $15.99. 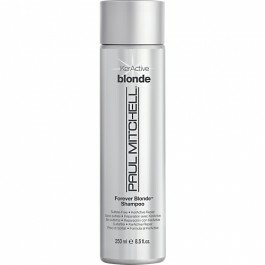 Blonde-haired girls out there, what’s your favorite blonde shampoo? 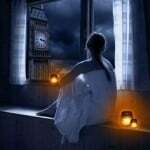 Thank you for sharing your positive and supportive comment. 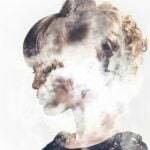 Please feel free to share your insights and experiences in the future. Have a great day, Karambit! I have not tried that–does it work well? Thanks for commenting, Denise!